Together, we are discoverers of the world and ourselves. The world is no longer predictable and learning needs to be more adaptive, connected, and interdependent. Education can respond to this constantly changing landscape with agility. Through our journey, new paths unfold to reveal learning authentic to us. We invite you to use this compass to navigate the unfolding opportunities. Making intentions explicit and visible fosters partnerships and allows for a meaningful and relevant education to emerge. Learning starts with why … it’s the big story. The real lessons of life are embedded in experience. Nurturing the love of lifelong learning. Partnering in a learning journey catalyzes continuous growth and ownership. Valuing the freedom of discovery. Providing space for human diversity increases agency and self-direction. ​The power of shared learning. 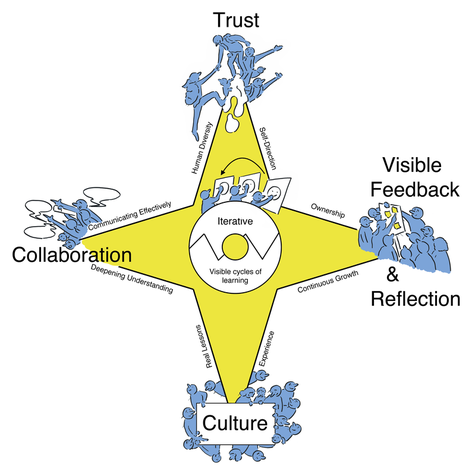 This compass was created by a group of passionate Agile Educators who met face-to-face at the Scrum Gathering in Orlando, Florida between April 16-20, 2016.